This week to garner the occasion of Teachers’ Day, we bring to you some reflections and heartfelt words from our Director and one of our most loved teachers, Professor Janat Shah. We enter the cabin after a short wait, and a little time bargain with a fellow visitor. The humble Professor greets us with a kind smile and offers us a seat. Zeeshan is ready with his camera and in one glorious opportunity, out comes my smartphone. I hit record, and our conversation begins, interspersed with his contagious laughter. MiiC : Sir, please share with us a little about your time as a student, maybe something memorable from your school or college years. Prof. Shah : It has been so long, schooldays were so many years back ! You know what happens, when you look back on life sometimes, you tend to forget. I kept changing schools as my father moved to various places in the city. Then I did my engineering from IIT Bombay, then worked for five years and then did my Fellow Programme at IIM Ahmedabad. MiiC : How was your stint as a fellow programme student ? He responds with surprising candor and a frank laughter. 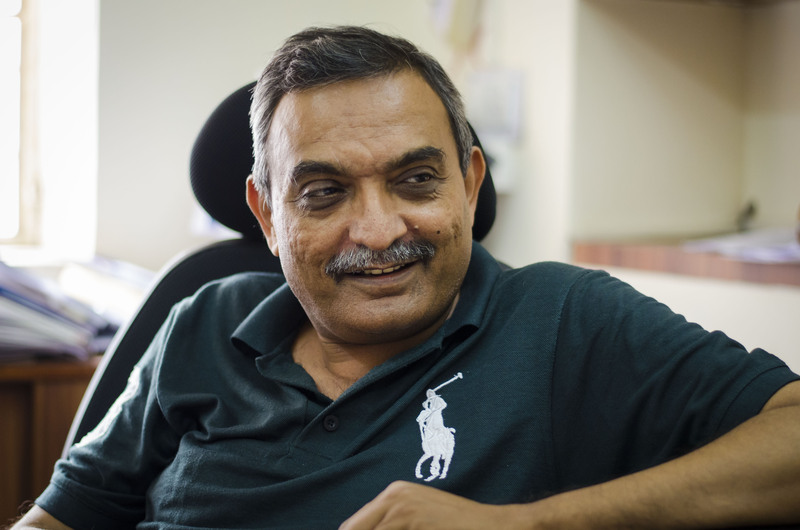 Prof. Shah : Initially, I didn’t know why I was doing a PhD. I just wanted to switch from Corporate and here was a programme where they were also offering a stipend and so I joined. But I decided to cross the bridge and do it more seriously than I had studied in my undergraduate years. MiiC: Sir, you are an inspiration to so many of us. Could you tell us about a teacher who has left a lasting impression in your life? Prof. Shah: Yes, I have had some outstanding teachers. For instance, Professor Jahar Saha, he is also a visiting faculty with us. In IIM, I would say, we had teachers who were outstanding in terms of not just what they taught about business in class but about life as a whole. We had Professor Balakrishnan who taught Management Accounting which for lot of people can be very mechanical, but I would say I learnt business from him. I believe the best teachers are those who excite you about life, push you beyond. In engineering back then, we used punch cards for computer programming where you got the result for your codes only the next day. So a single error can ruin it completely. We had great teachers on this subject as well. Then we had a professor who invited us to dinner at his place. Also we had an out-of-the-box warden who would never visit hostel and would blindly sign any letter or certificate, be it for extension for fees payment or anything at all. So I think people who trust you make a huge difference. I believe therefore I had a range of teachers who not just taught me business but about a broader way of looking at life. MiiC : Sir, you have been leading IIMU last five years. Would you tell us about some of the challenges you faced, assembling the team and so on and so forth. Prof. Shah: I would say the challenges we faced in the first four months were immense. When I took over, I had nobody but I had some ideas. I wanted to give the students here the same facilities that our students at IIM Bangalore had. We had a few things in mind that we put down as a necessity, like great classrooms. CR-1 that you see was done in less than a month. Similarly arranging for fast Wifi, high quality IT infrastructure and then bringing in outstanding faculty were some of the things we aimed at. Being able to deliver these starting from scratch was much fun. MiiC : Sir, as a teacher how do you deal with students having different vibes and aspirations ? Some may work well under pressure while some may underperform. Prof. Shah: I think this a challenge where I have sometimes, though not always, been successful. Say there were two courses I remember two courses very well from my teaching life. In one, I had systematically planned my course. I knew my entire student profile, and I had planned something for every group. So you see, you need to recognize but you shouldn’t target any one particular group. But this requires fair amount of effort but when that effort is put in, it is highly rewarding. The second course that I highly enjoyed teaching was one which I had designed very differently, deciding it would just have my own cases. We met once a week in a two hour class. Every Sunday, they were given a case and the analysis that the students did was amazing. So everywhere I find that as a teacher if you are excited about the course, then students always reciprocate. MiiC : Sir, as a teacher who has also worked in the corporate what would you say are the challenges and rewards in migrating to the teaching profession? Prof. Shah : I think firstly you should enjoy working with young people, secondly a lot of patience and thirdly a lot of empathy. For instance, if someone comes and says I could not submit an assignment, you could say I don’t care or you could choose to understand why. Or you could be very strict inside the classroom and once out, understand why and how certain things happen. So, if you have these qualities you would have a fun time, especially when somebody gets back after years and tells you how you made a difference to their lives. Say, just two days ago I had a one hour long conversation with a student who has graduated some fifteen years ago about his experiences then on. I would say in every batch there are always a few students with who I have developed a strong relationship which continued over years. MiiC: Do you have a personal hero? A real or fictitious character that inspires you? Prof Shah: I am great admirer of Gandhi’s philosophy. Other than that I enjoy literature, writings of various authors. On one side I read Harry Potter and on another I like Dostoevsky’s characters. MiiC: Tell us your take on balancing work and life? You being a busy person, how do you manage it? Prof Shah: I think valuing relationships is the first thing, and then recognizing you need to invest in them. Once you recognize this fact, it will happen. Several of us make this mistake of taking people close to us for granted, and believe they will always understand. You think you will spend time with them at later stage in your lives. But it does not happen. You need to invest time in them. MiiC: Sir, your cycling is legendary now! Any other hobby we do not know of? Prof Shah: Cycling is more of a practical thing! As you know legends are just mythology. I used to go for trekking amid nature once in a while though have not done it much off late, not for lack of time though. I did one major trek as part of club during engineering, then some in Maharashtra and one in Himalayas. MiiC : Sir, a question just popped up. Is there any book you read again and again? Prof Shah: Quite a few, like J.D.Salinger’s ‘Catcher in the Rye’ and Lewis Carol’s ‘Alice in Wonderland’. Some other authors whose works I like are Franz Kafka and Lee Carr. MiiC: If you had to give us a one line message Sir, what would it be? Prof Shah: I would ask you to be curious. To me that is the key element. If you are curious in life, you will discover a lot in life, in the smallest of things. We conclude the interview and talk a while more. The heartwarming encouragement remains with us as we walk out with a lot of thoughts and a treasury of pictures. Zeeshan has not been idle all this time. The interview gave us an opportunity to bring to you some of the savored moments and invaluable advice from life of an inspirational teacher. We bid adieu to return with many such engaging conversations. 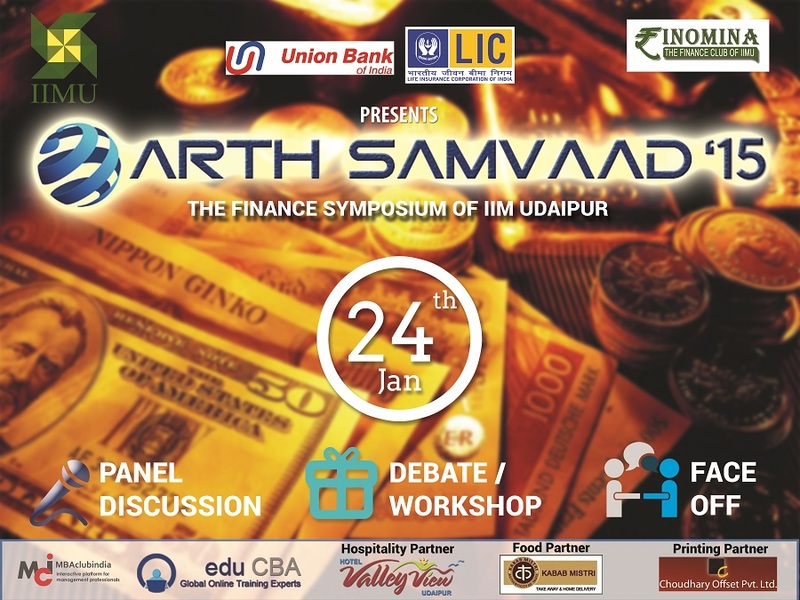 Arth-Samvaad is the flagship event of Finomina – the Finance Club of IIM Udaipur. Continuing the success story of previous 2 editions of Arth-Samvaad, the third edition of Arth-Samvaad assures an enriching experience with immense learning through panel discussions and various inter-college competitions. In tune with previous editions, we plan to host some of the most eminent personalities from the financial domain. Arth-Samvaad aims at the fact that, the future managers should get to know about the current trends in the industry and how the various macro and micro-economic factors interact in order to affect the way business is done all over the world. It is a platform to deliberate on developments in the world of FINANCE. This year we look at rethinking “Decades of Financial Folly” where the Panel discussion will try to unravel the cause for this euphoria and brainstorm whether the history will repeat itself again or not! Mr. Sriram Krishnan, Director – Citibank N.A. 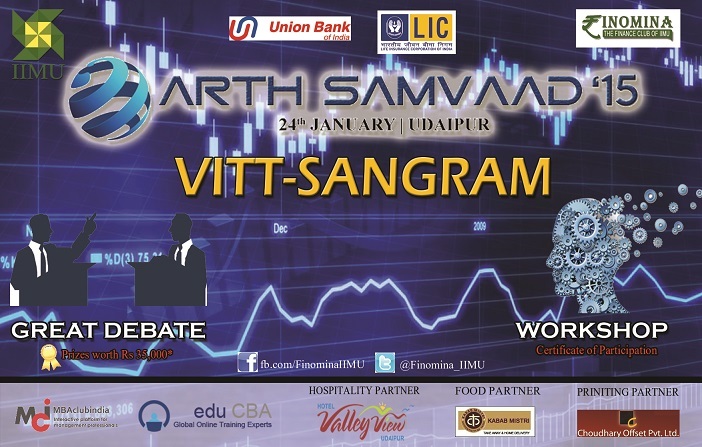 ‘Vitt-Sangram’, is a series of competitions organized by Finomina as a pre-cursor to Arth-Samvaad 2015. We began with two rounds of prelims for our Debate Challenge. First round required the participants to submit articles on the topics; ‘Oil break’ – short term or here to stay? And has RBI killed the Euphoria by delaying the rate-cut? The second round consisted of a 3 minute video submission on the topic “Increasing Regulations on Financial Institutions is Good”. The video was evaluated by an expert panel of faculty members. The finalists who will be battling it out in the grand finale are from IIM Lucknow, IMT-Gaziabad, NMIMS Bangalore and IIM Udaipur. 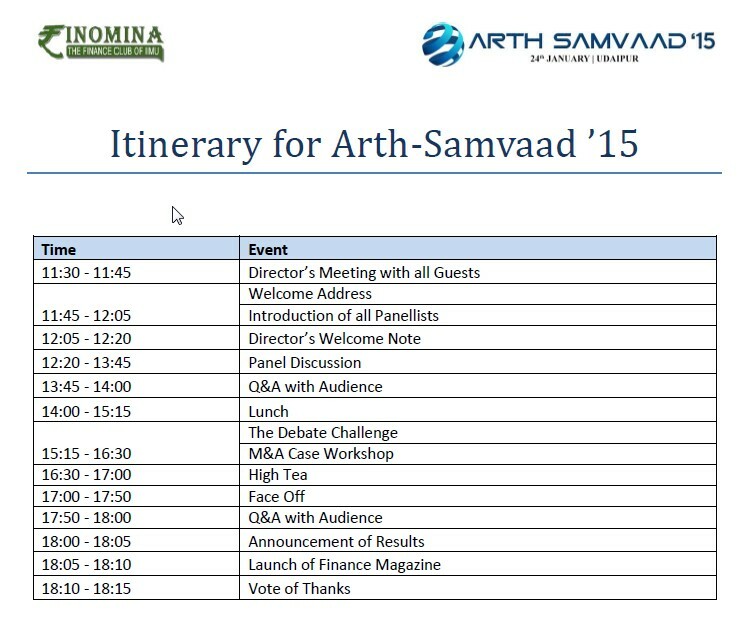 Finomina, as part of its flagship event, Arth-Samvaad ‘15 is organizing a case study workshop on Mergers and Acquisitions to be conducted by Mr. V.S. Sundaresan, Chief General Manager, SEBI. It is an opportunity to get the expert guidance on the Takeover process and M&A Deals along with first-hand industry insights. The participants will be awarded a ‘Certificate of Participation’ for the workshop. Face Off is a showdown between a stalwart speaker and a panel of students from the college. Mr.V.S. Sundaresan, Chief General Manager, SEBI will interact with a student panel on some interesting but contentious topics, utility of which is hugely debated when it comes to practice Vs theory. This will be a Two- Phased online quizzing challenge focused on the financial world where prizes will be awarded to the colleges that get the highest scores at the end of the challenge. Being a two-phased quiz competition, it will see only the best make it to the top and the league rankings. It will generate inter-college competition of a new dimension and will see participants from all over India. Things which differentiate IIM Udaipur – Global Immersion! The world is getting smaller and the distances between the nations are reducing. The economies of the world are integrating at a faster pace and there is a critical need for managers in the industry who have an understanding of global business practices, social values, philosophies and cultures. And since the business practices are increasingly becoming “glocal” in their planning, design and implementation, there is an inherent need to increase the skills space of students to fit into the global scenario of the corporate and entrepreneurial world. IIM Udaipur follows the pedagogy of Immersion and Global Immersion is one of the key offerings of IIMU which, with the immense potential of the associated programmes adds advantages in preparing students as better leaders who can imbibe environment and cultural sensitivity and manage businesses and people from diverse cultures. 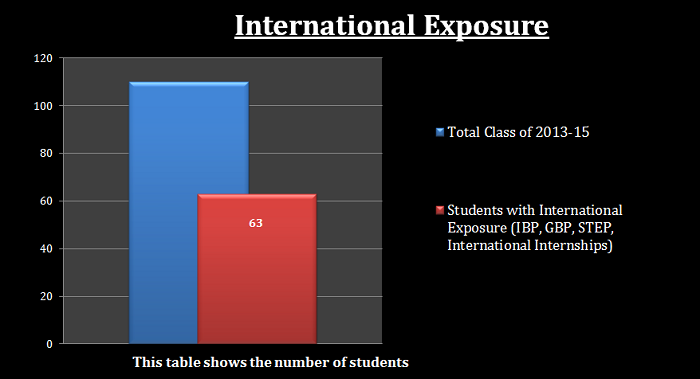 IIMU ensures provision of international exposure to its students in multiple ways with the aim to facilitate greater student and staff mobility across different global dimensions and institutional research partnerships through collaboration with globally reputed business schools of Europe, North America and Asia. The focus is to help the students in developing a specialized set of internationally relevant skills, perspectives and experiences with a thriving zest of peer pressure. This in turn helps in fostering a spirit of global thinking and developing acumen of personal and professional growth. 1. Dual Degree PGP for Executives in Global Supply Chain Management: IIM Udaipur and Purdue University’s Krannert School of Management have designed a dual degree programme to cater to the present global industry requirements and to equip the executives with skills to deal with complex supply chains across the world. IIMU’s students brush shoulders with students from Universidad Popular Autónoma del Estado de Puebla (UPAEP), Mexico and Tianjin University, China besides the students from Purdue. At the end of the program, students are offered a PGDM from IIM Udaipur and a MS from Purdue University, USA in Global Supply Chain Management. The nuances of Supply Chain Management theories and international business techniques and practices help the students to assimilate the learning experiences of studying overseas and honing their skills for the working arrangements in India & abroad. 2. Student Exchange Programme (STEP): The student exchange program at IIM Udaipur aims at giving the students a global exposure academically and culturally. The students spend a term of their course in globally acclaimed universities of Germany and France. This leap offers an adaptation to a bouquet of offerings like a broadened outlook, leadership attributes, team working, divergent mind set, keen eye for detail, communication skills, emotional maturity, healthy appetite for risk taking and decision making abilities. The breadth of STEP is one of the greatest opportunities that help the students to soak customs, traditions and pedagogy of other institutes as well as get a taste of different cultures. During this time, their counterparts from those universities come down to the IIM Udaipur campus. The globalization of businesses needs networking with people of different backgrounds. This opportunity helps students to interact with students of different nationalities and eventually build networks with people at a global level. 3. International Business Practices (IBP): IIM Udaipur offers a unique elective in the second year of its PGP Programme – IBP, where the students get a chance to work hands-on on a live project with industry experts in MNCs at their abroad locations like UAE and Bangkok. The sharing of ideas and experiences help the students to understand in depth, new markets and opportunities which can be tapped upon in the future. The holistic perspective and knowledge acquired about the nuances of global working methodologies enhance the scope of the future objectives of students. 4. International Summer Internships: The highlight of IIM Udaipur’s summer internship placements have been the international internships offered by companies located in UAE and Qatar. This is a continuation of the process where in a span of two months, students get to work in a global business environment in an economy different than the Indian environment. The cross-cultural exposure, diverse teams and the industry project covered in the internships complement the learning process. The experience gained during the period is immense and the exchange of ideas and the knowledge of global practices enhance the learning objectives and approach which the students have to follow for the rest of the three trimesters of the PGP Programme. 5. Global Business Project (GBP): GBP is a unique action-based learning course spanning across four months, February to May, wherein, under each project, 5-6 students from across geographies work on general consulting and strategic problems of clients under the faculty guidance applying their functional, cross-cultural, foreign language and virtual teamwork skills towards focused, compelling, measurable and actionable deliverables. Many companies which have provided projects are household names, such as P&G (China and Brazil), GE Health Care (Brazil), Eli Lilly (Brazil), CITIBANK (China), Google, SAP, PepsiCo and others. IIM Udaipur is a member of this prestigious consortium along with 12 global universities namely UNC-Chapel Hill, Columbia, George Washington University, Lingnan College, Miami, Maryland, Purdue, Pittsburgh, San Diego State, University of Connecticut, University of Wisconsin and UNISINOS. 6. Joint Research and Faculty Exchange: Faculty Groups working together on collaborative research projects is another channel for engagement which adds a dash of benefits in increasing the international exposure factor of those associated with the institute. The Center for Development Management (CDM) at IIMU has a MoU with Duke University’s Sanford School of Public Policy for joint research and faculty exchange. CDM is a research center that seeks to address development challenges in India by bringing management skills and social science knowledge, together in order to enable qualitative social transformation through the Summer School Programme. 7. International Visiting Faculty: IIMU has faculties visiting from Switzerland and France to teach electives with a global perspective. This in addition to the other programmes ensures that the students and the campus benefit from the international exposure. 77% of the students from the First Batch of IIMU had an experience of studying or working in another country in Europe, Middle-East or South-East Asia while studying at IIM Udaipur. Around 60% of the students from the Second and the Third Batch can boast of the same, and this trend is bound to rise and continue for years to come. When 60% of the students get their visas stamped at least once during their stay at IIM Udaipur, it truly reflects IIMU’s commitment to make global managers of tomorrow ready to work in diverse conditions and situations, leading global teams and implementing their learnings in the real business world.